Coway latest flagship – the AIRMEGA 400S is a vital device that will almost certainly shape the design of the iconic series going forward. Today, we will make a AIRMEGA 400S Review to help Breathe Quality’s readers determine to invest into this device or not. There is one reason the Korean giant – Samsung is not successful at air purifier industry over the world, and that reason is this brand – Coway. With nearly 30 years in air purifier industry, Coway is a true symbol to life-care service sector in Korea. AIRMEGA is the result of years of extensive research and development that Coway put this name aside their traditional air purifiers, so they can improve and develop it better. Now, because you are here, let’s see if we should consider this air purifier at home in this AIRMEGA 400S Review. As good as the AIRMEGA 400S is though, it’s not perfect. It also comes at a cost that might make you to think it through. The 2019 flagship AIRMEGA 400S reflects the Coway’s ambition to target high-range segment. Talking of Coway’s chief competition, the AIRMEGA 400S price now rivals that of Honeywell HPA600B and Blueair Classic 605, rather than undercutting it as we’d hoped from an Asian brand. The AIRMEGA 400 (the no-app model) price at launch was $649, which is exactly the same with a Smart Blueair Classic 480i. And the AIRMEGA 400S costs you around $749, for an add-on of automatic Sleep Mode and both Android and iOS apps connection. Yes, that highest level AIRMEGA 400S can cover 1560 sq ft, which does double the room coverage of Blueair Classic 605. But is it better? We will find out soon. AIRMEGA 400S colors in the US are the same as in Korea, with a classic White and Graphite. These basic colors once more show how poor the ideas of decorating air purifiers these days could be. Anyone who fancy a colorful air purifier should look for Rabbit Air or Blueair to fulfill their wishes. 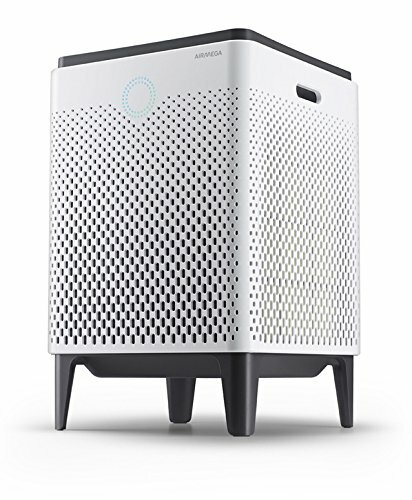 In the US, Coway will sell the air purifier through mainly Amazon. That’s why you should look below for an incredible deal that can’t be missed. Coway AIRMEGA 400S Air Purifier with best air filtration technology in Graphite Edition. New products from $660. The stylish Graphite edition for one of the best air purifiers in 2019. Deal for a limited time. Coway has never been coasting for too long with any types of design. And that all changed since the AIRMEGA 300S, in a big way. AIRMEGA 400S closely resembles this design style, with a bigger form. Howerver, AIRMEGA 400S genuinely offers something different. The size is officially bigger with 22.8 inches in height and 14.8 inches in both depth and width, compared with the 21.2 inches in height of AIRMEGA 300S. AIRMEGA 400S packs all the design tweaks and material choices that debuted with the AIRMEGA 300S: a bulky device with 4 legs. This air purifier feels thicker and more difficult to move from one place to another. Grabbing it one-handed has proved a hard feat for me, with a very narrow handle and a weight of 24.7 lbs. AIRMEGA 400S weighs as much as double the Coway AP-1512HH, and easily match the weight of Honeywell HPA300. However, this weight is still a lot better than the 35 lbs Blueair Classic 605. There are no major difference from both the front and the back of AIRMEGA 400S, with intake air grill from everywhere. This design concept is mostly because of the large room coverage of AIRMEGA 400S, to help you put this air purifier anywhere to reach maximum efficiency. The only exception is the air quality indicator on the front to show the current air quality in your room. On top of this air purifier is a typical outlet air vent to take out the fresh air. There you will find the controller of this device. The AIRMEGA 400S is a smart device so it no longer has as many buttons as the previous Coway air purifiers. We will only have one on/off button and two air filter indicators. Coway claims AIRMEGA 400S is the strongest ever. From both its look and the pretty well-built materials, we could expect a device that could last for a long time. Pre-filter – A powerful washable pre-filter is available to help you capture large objects of contaminants. Remember to dry the pre-filter in the shade before re-installing it. Max2 filter – A combination of both Activated Carbon Filter and True HEPA filter, this filter can both capture up to 99.97% of airborne particles 0.3 microns. 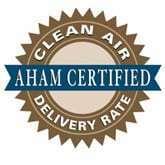 It also reduces more than 99 percent of volatile organic compounds and reduces fumes such as NH3 and CH3CHO. Of course, the biggest controversy with the ionic filter irritating asthma and respiratory issues pushes Coway to remove this function from their latest flagships. Both devices in the AIRMEGA series, 300S and 400S will have no ionizer feature at all. However, that’s not a great issue for the high-quality True HEPA filter of your AIRMEGA 400S. For the Max2 filter, it doubles the size of a normal Coway Anti-virus HEPA filter. A bigger size air filter usually means better performance rating in large spaces, typically from more than 300 sq ft.
Back to the signature Max2 filter, I have high expectation for this flagship air filter, mostly because of the high reputation from the Coway AP-1512HH. I had put these 3 high-range air purifiers within a same testing conditions to see if AIRMEGA 400S is really worth your money. The other two are Blueair Classic 605 and Honeywell HPA600B. Also, to show you why you need a high-range air purifier, I also run a low-range Honeywell HPA200 at the same conditions. The clear winner was Blueair Classic 605, with an unmatched result of trapping 99.97% of as small as 0.3 microns particles, while the AIRMEGA 400S is the runner-up with 99.95%. Both the Honeywell HPA600B and Honeywell HPA200 ends up much below, with 95% and 82%, respectively. My test conditions: Room coverage of 700 sq ft and non-stop running for a full 1 hour. As you can see from the test, the AIRMEGA 400S is a premium device because it can remove a high portion of pollutants in a large room effectively. Other low-range air purifier like Honeywell HPA200, though still for a large room, is no where near the efficiency of this AIRMEGA 400S. 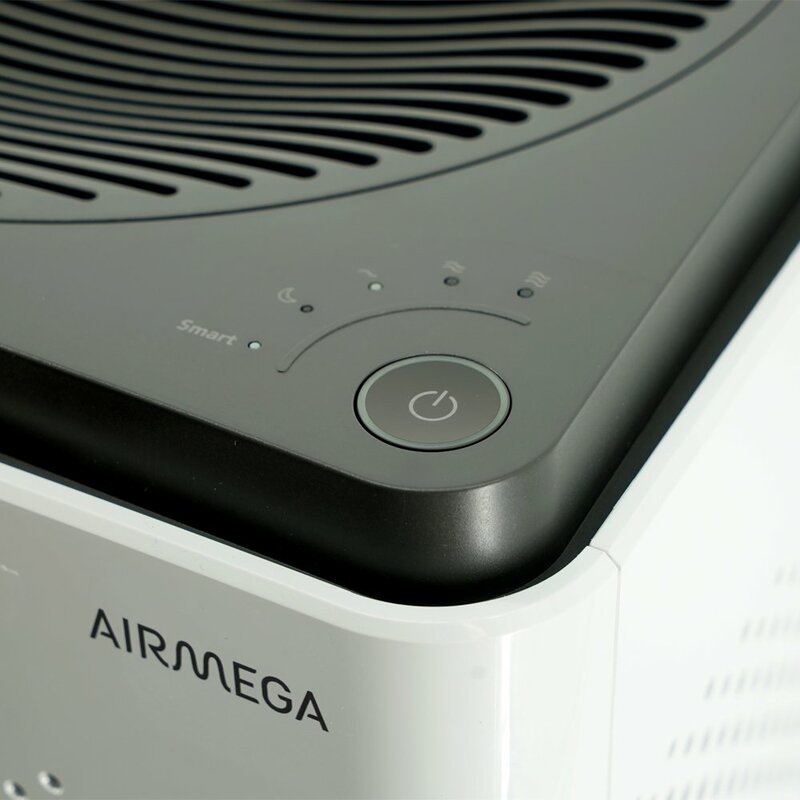 For a smaller room, the AIRMEGA only needs about 30 minutes to deal with all the contaminants. You are in the high-range market, therefore you can’t expect a cheap air filter cost. The Max2 filter of AIRMEGA 400S cost from $99 to $129, and can only last for 1 year. For a better performance, the Blueair Classic 605‘s filter is around $75, but needs to be changed after 6 months. As you can see, the annual filter cost of AIRMEGA 400S is slightly better. There are more significant improvements in room coverage for AIRMEGA 400S, but again, for the sacrifice of other specs. In the manual, the AIRMEGA 400S states that it can cover up to 1560 square feet. But if you double the air changes per hour (ACH), this air purifier is only effective at exactly half, for a 780 sq ft. The ACH of AIRMEGA 400s is 2X to 4X. For a high-range air purifier, this ACH is on par with Rabbit Air MinusA2, but not as good as how Honeywell HPA600B can do. The CADR of AIRMEGA 400S is not told in the manual. But through many tests, I recorded a reliable CADR of 340 Dust/ 350 Smoke/ 400 Pollen. For a large room air purifier like AIRMEGA 400S, this CADR specs is quite insufficient for the room coverage of 1560 sq ft.
We can all agree that one of the most winning advantages of Coway air purifiers is the quiet operation. For Coway AP-1512HH, I had experienced no air purifier could go as quiet as this device. As the flagship of the Coway brand, AIRMEGA 400S must strictly follow this perfect noise level. Well, you won’t be disappointed. The noise level of Coway AIRMEGA 400S ranges from 22 db to a maximum of 52 db. This air purifier is as quiet as the Ultra Quiet Rabbit Air MinusA2, despite of having a much higher fan power. For your information, a high fan power often means an inevitable noise, but it seems Coway is truly impressive at improving their fan. The noise level at the lowest fan speed is exactly the same as the whisper, or rustling leaves, which is hard to hear anything. Even if you run this air purifier at highest settings, the Coway AIRMEGA 400S only produce white noise, which can be suitable for even a bedroom. Also, I mostly find AIRMEGA 400S in the professional offices. One of our most FAQs is “Do air purifiers use a lot of energy?” The fact is you need to use air purifier for a long time to be efficient. Especially for a large room air purifier like AIRMEGA 400S, the power consumption is one important criteria to decide if you should buy it or not. With 66W, the power consumption of AIRMEGA 400S is quite reasonable. I never expect such an air purifier designed for large room could use less energy than a light bulb, right? For a same performance rating, AIRMEGA 400S only consumes half of the Honeywell HPA300 could do. Also, thanks to the reliable Eco Mode, I would expect much less energy to be consumed by this air purifier. For a quick comparison, the Blueair Classic 605 has a better performance, but the highest power consumption can be 100W. Or the Honeywell HPA600B with less room coverage, but better power consumption of 44W. Again, AIRMEGA 400S is likely to be in the middle. Efficiently, it would cost you around $24 per year. That means the AIRMEGA 400S has a double cleaning power with only the same energy cost as the Winix WAC9500 or Winix 5500-2. Additional features are handy for making a high-end air purifier with ease of use. As a high-range air purifier, there are a lot more in this AIRMEGA 400S than a $200 Coway AP-1512HH. First, you will benefit from the most accurate Smart Sensor in the world. There’s so much to say about the Coway automatic features, and most of them are good reviews. Most importantly, the unique Eco Mode from Coway air purifiers will help reduce the power consumption to as low as possible. But the most anticipated part of this flagship is the Smart App Enabled function. Using the Coway IOCare Mobile app, you will receive the real-time air quality notifications, also with a filter lifetime monitoring, and scheduler. However, this IOCare app has received mixed reviews, and mostly negative. It seems Coway doesn’t bring out the full potential of App control. I have the feeling that there is a weak dev team behind the app development work. Without the app, AIRMEGA 400S is still a high-end device with stable features like intuitive air quality indicator or LED filter replacement indicator. As one of the top electronic brands in Korea, Coway is somehow as huge as Samsung. This brand not only carries out clean innovations for the customers, Coway also delivers their direction as Coway Trust. That’s why Coway always strongly focus on their customers and community. With global subsidiaries and regional dealerships that serves over 60 countries, you should believe in the 3-year warranty for every product from Coway brand. Moreover, you can contact them via phone at 800-285-0982, or via email at info@airmega.com. Normally, they will try to contact you back within 24 hours. In the writer’s opinion, the Coway AIRMEGA 300S offers a same performance rating with a much more reasonable price tag than the successor AIRMEGA 400S. Nevertheless, I doubt anyone will be unhappy with the great performance and features brought by the AIRMEGA 400S. The one slight disappointment with regards to the power is that within a large room coverage of 1560 sq ft, AIRMEGA 400S should make a better fan power with higher CADR and ACH. Should I buy AIRMEGA 400S? Yes, the AIRMEGA 400S is exactly the flagship of Coway. It has better quality in air filtration process, better fan power, better everything. If you have serious allergies or asthma to airborne pollutants: the AIRMEGA 400S is the most powerful air purifier with True HEPA filter of this brand. 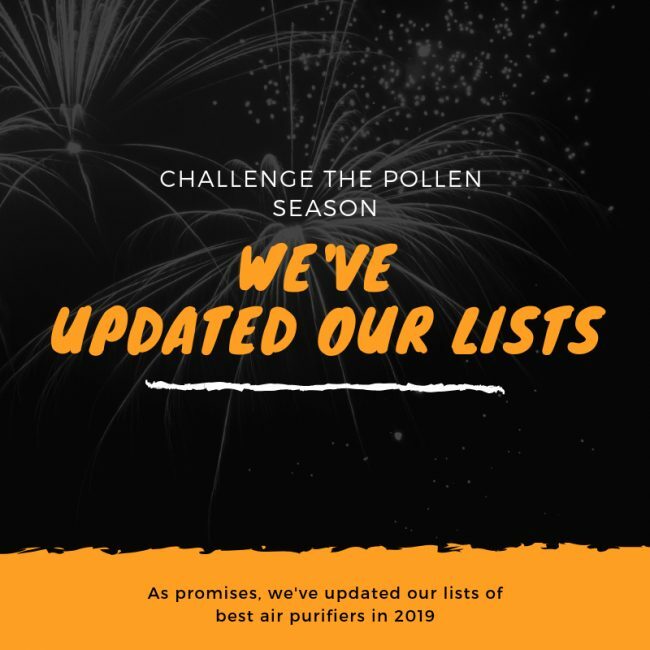 If you want a better performance, or better fan power to clean your room faster: you can look for the Austin Air HealthMate Plus, Austin Air Bedroom Machine, Airpura V600 and Oransi EJ120 for higher CADR ratings. If you need an air purifier with a better room coverage: the Airpura R600 and Airpura V600 can clean better for a room of 2000 sq ft. If you need a budget version of this air purifier: you can look for the Honeywell HPA250B or Winix HR1000, for both smart features and great air filtration process. If you need a more silent air purifier: the AIRMEGA 400S is truly silent for the price. 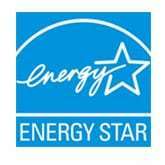 If you care about the annual filter cost and energy cost: the AIRMEGA 400S is one of the most saving options for you. If you love the additional features: this AIRMEGA 400S has all the additional features that you would love. A worthy comeback for the Coway AIRMEGA brand. Coway AIRMEGA 400S has an excellent air filtration process and many additional features, but with an increase in the cost.